Premieres Sunday, June 22 at 8pm on BBC America. There are some classics that have been adapted so many times and in so many ways that even if you've never picked up the book, you can be acutely familiar with the story and the characters, as if you were born knowing them. Alexander Dumas's The Three Musketeers is one of those stories, having been transferred into film and televisions countless times, as well as being featured as a comic, video game and musical. The BBC has made series based on the novel twice before this iteration. With material so familiar, there's an expectation that new versions will offer a fresh perspective, but Adrian Hodges's take on the French adventure story feels remarkably hollow. 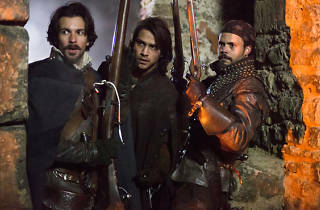 Presented as a kind of period procedural, The Musketeers launches with the young D'Artagnan (Luke Pasqualino) seeking out musketeer Athos (Tom Burke) after a man claiming his name murders the lad's father. 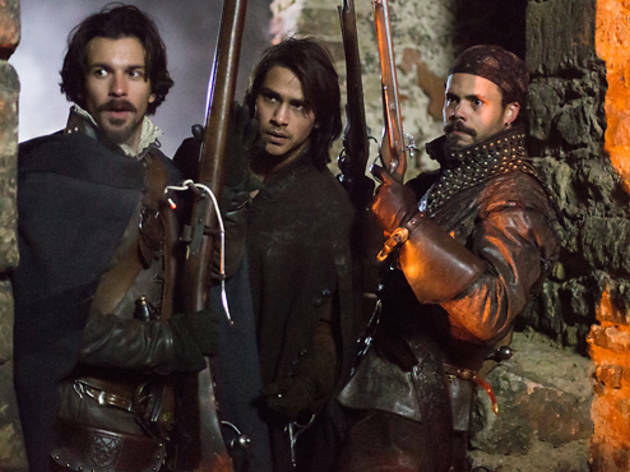 Full of piss and wind, D'Artagnan challenges Athos to duel in front of his compatriots Aramis (Santiago Cabrera) and Porthos (Howard Charles). The fight is interrupted by guards coming to apprehend a framed Athos, as a man masquerading as him has committed several other crimes. For their first case, the remaining trio come together to find the truth and exonerate their friend before he is executed. The most recognizable face in The Musketeers ensemble is soon-to-be Doctor Who Peter Capaldi, who steps into the role of villain Cardinal Richelieu. Despite Capaldi's impeccable record of scenery chewing, what seems like a perfect piece of casting falls flat, relegated mostly to boring back-room manipulations. Jason Flemyng's guest turn as a baddie in the second episode is far more gleeful and menacing and a much better representation of the villainous energy for which this show is starved. In general, the cast proves to be merely adequate living up to their roles, with no real standouts. There are some fun sword fights and scuffles featuring attractive, bearded men with occasional humor thrown in but, everything feels a bit stale and safe. There's nothing fresh here that makes the case for returning to this well-known story again. It's ultimately a mildly entertaining piece of television, but inconsequential.